The Barnacle, a floating food boat that specializes in cones, will open May 1. Sure, food carts are nice, if you’re at a brewery. But can a food cart bring you an ice cream bubble cone when you’re out on your friend’s boat? Starting May 1, three partners will open a kind of mobile restaurant they say has never been seen in Virginia Beach. Weather and scheduling permitting, the Barnacle will post up Thursdays to Sundays at the Narrows on 64th Street, at the edge of First Landing State Park. The boat will be open from 10:30 a.m. till sundown. “We’ve always been under the idea that there’s never food out on the water,” says co-owner Bo Zinno, whose mother’s restaurant the Anchor Inn served crab cakes and steak for 30 years in Virginia Beach. The Barnacle will be mobile, and hireable for private parties at places like Bay Island. But for now, its home base will be at the Narrows along Broad Bay near Virginia Beach’s northeastern tip, where the boat will be accessible to walk-up customers via a mobile dock. Boaters will also be able to pull up alongside and pick up food, bags of ice, ice cream bars or even sunscreen. The food at the Barnacle will mostly come in a single shape: a cone. But those ice cream waffle cones won’t be the familiar sort invented by Norfolk’s Abe Doumar over a century ago. The cones served at the Barnacle will be the Hong Kong-style street snack that’s become an Instagram phenomenon over the past two years. Also called egg waffles, the bubble waffle cones are made fresh, stuffed with ice cream and topped with scads of whipped cream and often other toppings. Zinno says a lot of locals have already seen the boat and are plenty excited. 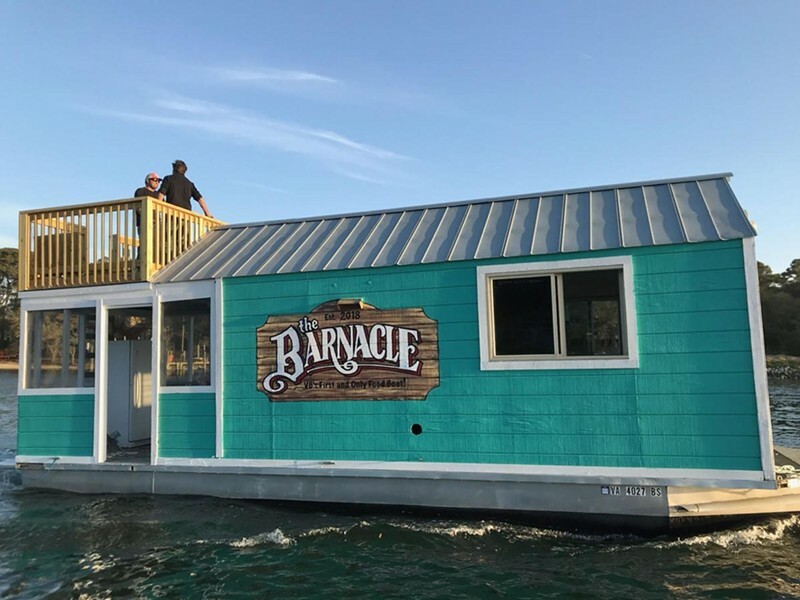 The Barnacle will open officially May 1, but Zinno said anybody who wants to should come out for a preview from noon to 5 p.m. on April 25 – especially if they happen to have a boat. That’s when the Travel Channel and the Food Network are scheduled to be filming the Barnacle for a new show about food boats, he says. If You Go: The Barnacle will open May 1 at the Narrows on 64th Street, off U.S. route 60 in Virginia Beach, 757-618-5788, facebook.com/BarnacleVB. Weather permitting, planned opening hours are 10:30 am to sundown, Thursday to Sunday.